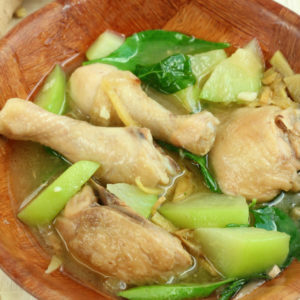 Tinola is a chicken soup with lots of ginger and other good stuff in it - the ultimate comfort food for the sick and during cold times and easy to prepare. In a pot, saute garlic, onion and ginger in oil until tender. Add in the chicken pieces and fish sauce. Cover and let simmer for 5-10 minutes under medium low fire. Liquids will usually come out from chicken. Add water and bring to boil. Let it simmer for 20 minutes. Add the chayote and let it cook for 5 minutes or until it becomes soft. Add more fish sauce or salt if needed. Lastly, mix in the chili or pepper leaves before turning off the heat.